Growing up in Bulgaria we always had lamb for Easter. It is an old religious symbol that has been adopted by many branches of the Christian faith, and especially the Eastern Orthodox. Lamb is believed to represent Jesus and relates his death to that of the lamb, sacrificed on the first Passover. However, since I grew up in times when religious beliefs were strongly discouraged in communist Bulgaria, my grandma and then my mother rarely talked about religion when preparing the Easter lunch. So for me, the festive Easter meal with family and friends has become associated a lot more with celebrating the beginning of spring than the resurrection of Christ. Today, I like to carry on some of that tradition in my house and prepare a big lunch with lamb and fresh spring fare in honor of my grandma who never gave up her faith. If you haven’t decided what to make this Sunday there is still time to plan a delicious spring lunch that will take almost no time. Here is just a suggestion. This is easy to make on any given week night as well. Mix garlic, herbs, salt, and pepper in food processor, add oil, pulse until pasty. Cover the lamb chops with paste on both sides. Let chops sit for at least one hour to absorb all flavors. Turn grill on high. Grill chops for 1 and 1/2-2 minutes on each side on high to sear them, then turn grill down to medium-low and grill another 3-4 minutes flipping the chops once. Prepare sauce while the chops are sitting in the herb paste. Store in refrigerator until ready to serve. Mix yogurt, garlic and lemon juice in blender. Add mint and continue mixing. Add cumin pepper and salt and pulse one more time. 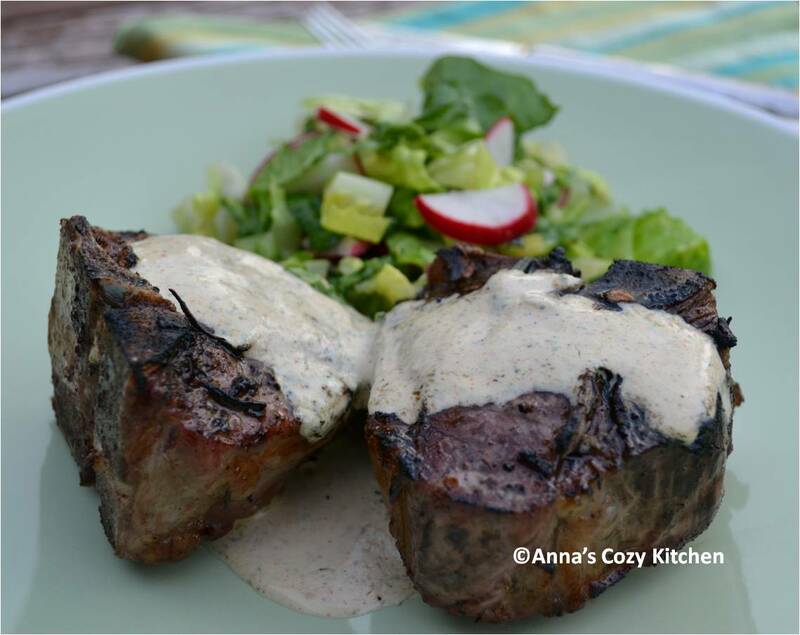 I served this meal with a fresh spring salad with radishes for which I’ll give the recipe in a separate post. Are you making anything special this Sunday? I’d love to know. 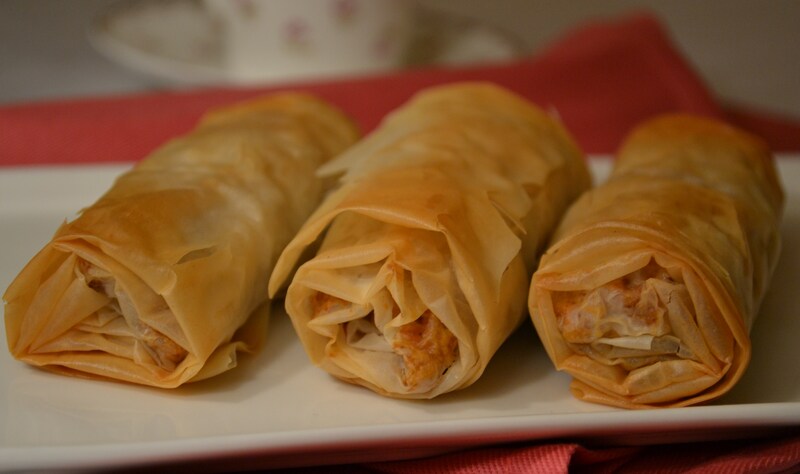 I am so excited to announce that my sweet potato fillo rolls won the runner up prize in the sugar-free category of the Sweet n’Healthy recipe contest. Yey! This was the very first time I submitted recipes to a contest. I’d say it is a good start. Thank you, North Carolina Sweet Potato Commission, for noticing and awarding my recipe. Thank you, my dear friend Galya, for the great recipe idea. You are as much a winner as I am! Thank you, dear readers, for sticking with me and coming back for yet another sweet potato recipe. And most importantly, thank you Aaron, for suffering through a whole month of eating nothing but sweet potatoes. I can’t promise that I am not going to do it again though. Also, congratulations to the other 5 winners. I am proud to be in such a talented company. I can’t wait to try your recipes as well. Sweet potato linguine, what a great idea. Mexican flavored sweet potato salad, any day. Cheese straws, the grown-ups in our house would love them too. Spicy scones, I am making those this weekend. Kid-friendly tacos, will keep those in mind when little ones are visiting. And now dear friends, I need your help. My prize is a $200 gift certificate from Williams Sonoma. There are so many great buys there that my head is spinning. So please give me suggestions on how to best spend these $200. What would you buy? And please come back for new spring recipes. I promise there will be no sweet potatoes for a while. Are you in the mood for something savory or sweet? It doesn’t matter. If you have sweet potatoes at hand, you can create almost any type of dish you crave; from salads and stews to cakes or sorbet. That’s what I learned during my adventures trying to create a unique sweet potato recipe. No wonder everyone who tries them immediately falls in love with sweet potatoes. Here is my latest take. The challenge is “sugar-free”. I didn’t think I can come up with a sugar –free recipe, but old Bulgarian traditions came to the rescue again. As I was telling a friend the other day about my latest cooking experiments, she mentioned that she has found a great use for sweet potatoes: fillo pastry rolls stuffed with sweet potato and walnuts. Something we would make with pumpkin in Bulgaria, but made with sweet potatoes and raisins it eliminates the need for added sugar. Tasty and healthy. Love it! In a small bowl soak raisins with rum. Use just enough rum to cover the raisins. Peel sweet potatoes. Boil them for about 10-15 min until tender but not too soft. Let cool, then grate. In a mixing bowl, combine grated sweet potatoes, chopped walnuts, rum raisins, cinnamon, nutmeg and salt. Open fillo and spread flat. Place it vertically on the counter with short side facing towards you. You will use one sheet for each roll. There are 20 sheets in each sleeve. Lightly brush the top sheet with melted butter. As you look at the sheet placed vertically, divide it in your mind in three vertical stripes. Spread two tablespoons of mixture in the middle stripe (try to keep mix in the bottom part of sheet). Fold the sides in and roll into shape. When you are rolling, the fillo in the part with the mix may break. That is why it is important to have enough length of the sheet free of mix so that it can cover the broken part as you continue rolling. Repeat with rest of sheets. Arrange on a lightly greased baking sheet. Lightly brush rolls with butter before placing in oven. Bake for about 30 min or until golden brown. Yesterday, March 3rd, was Bulgaria’s National Holiday. In honor of Bulgaria’s independence, I decided to make what I believe is the most Bulgarian dish – Kavarma. Don’t get surprised when you read below and you see nothing unusual or too exotic about it. As I have mentioned before, Bulgarian cuisine is very simple. 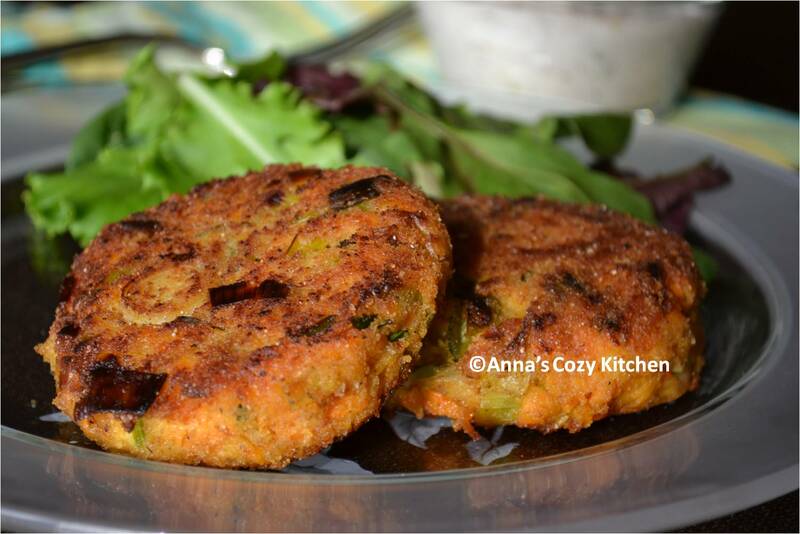 We use just a few fresh and flavorful ingredients and spices and vegetables are always present. 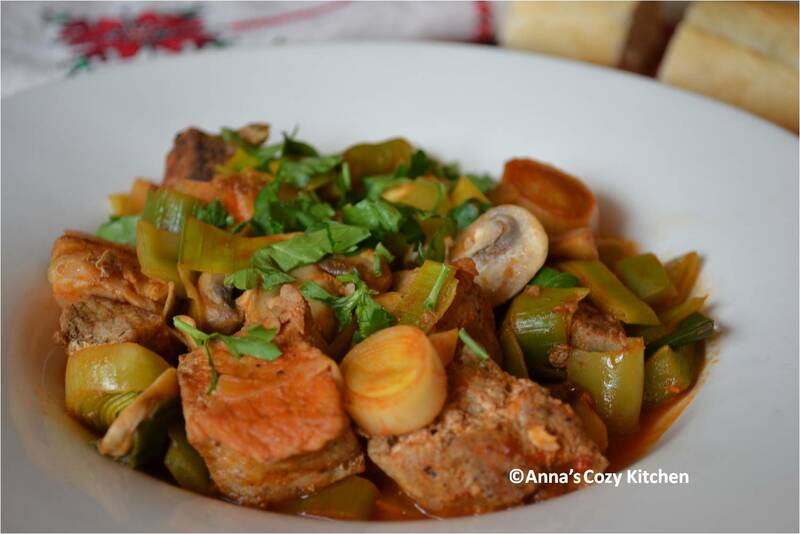 Even if you are not Bulgarian, have not been to Bulgaria, have never heard of Bulgaria, you HAVE to try this recipe. 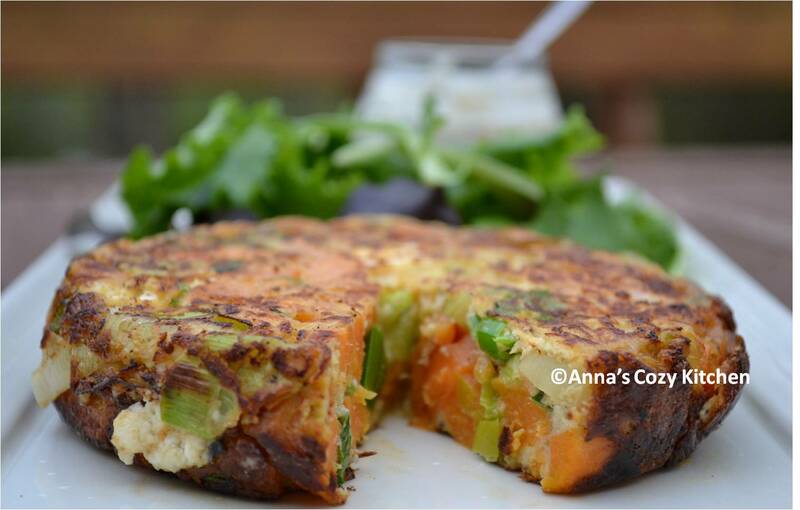 In my opinion, this is one of Bulgaria’s greatest contributions to world cuisine for a few simple reasons: it is easy, quick, healthy, flavorful and delicious. Kavarma is prepared like a stew but cooks until most liquid evaporates. It is made throughout the year, but I particularly enjoy it on a colder day. Traditionally Kavarma is made with pork and that is how I made it this time. But if you prefer it is equally tasty made with chicken instead. In a large skillet, brown pork cubes on medium-high heat. In a medium size cast iron pot (any pot will do it) saute the small onion and carrots. Add meat and bay leaf to the pot, stir. Then add mushrooms, leeks and pepper. Pour wine. Let simmer for about 10-15 min. Add cumin and oregano. When liquid is almost gone add tomato puree, sugar and crushed red pepper. Let simmer again, until liquid has evaporated. The dish can be served straight or on white rice. I also like it with couscous, as it takes only 5 min to cook. Kavarma is one of my work week favorites. What are some of your favorite work week meals? Growing up in Bulgaria, grilled cheese was not one of my childhood staples. Even when I moved to America I never quite learned to enjoy it. Probably because it is one of those comfort foods that one grows up with and gets to love the way their mom made it. But when I saw this recipe in this month’s Southern Living magazine, I found it too tempting to ignore. Goat cheese is one of my favorites especially when paired with something sweet. And the thought of the strawberries and arugula was just too fresh to pass. I was also curious to try red pepper jelly for the first time. It is one of those Southern classics which I’ve been so curious to learn about since I moved to Nashville. I loved the sweet heat of the jelly and found it to be a perfect pair for the smooth and tangy goat cheese. A modern take on the Southern tradition of crackers with cream cheese and red pepper jelly. So, last Sunday for lunch, I made this recipe and have to report it was DELICIOUS. Everything I love in one fresh, flavorful, and creamy package. I see now why it is so easy to fall in love with grilled cheese. I truly enjoyed the taste but realized that there was something missing. Both Aaron and I are carnivores and I had to figure out a way to get us a piece of meat for a complete meal. Nothing could be a better fit than a piece of bacon, another American classic. I used turkey bacon for a healthier touch. Spread goat cheese on one side of 4 bread slices. 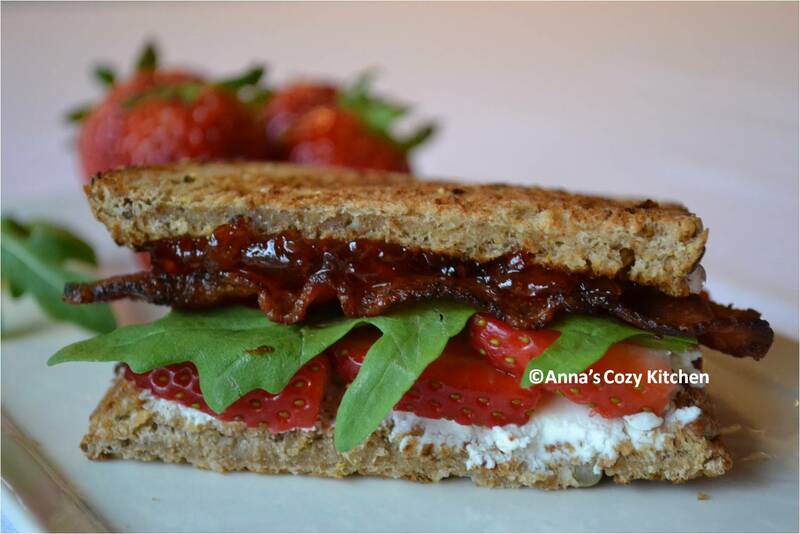 Spread thin layer of pepper jelly on one side of remaining bread slices; layer with strawberries, arugula and bacon. Sprinkle with salt and pepper to taste. Top with remaining bread, goat cheese sides down. Cook sandwiches in a large, lightly greased nonstick skillet over medium heat 2-3 minutes on each side or until golden brown. Although I love basil, I omitted the basil from the original recipe as I felt it added just one too many flavors to this perfect piece. Are you a grilled cheese conservative or do you like to experiment with this American favorite?